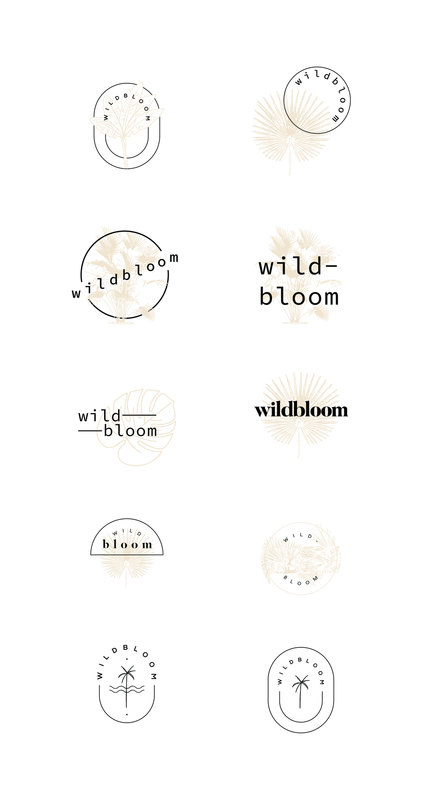 Steph from Wildbloom came to The Binding with the problem of feeling disconnected with the current branding she had in place at the time. About to ramp up with her own strategies and content creation she wanted to refresh the visual identity of the business so that every touch point helping promote her services were strong, consistent and something she'd be proud to stand by for years to come. With the aim to build a vibrant (but not corny) and tropical inspired theme the creative process saw many fun concepts of how we could capture her vision and vibe. Initially the designs were created in a simple colour palette to allow the layering effect to work and for the form to be truly seen - knowing that the colours could be refined in the following stages. With the favourite designs being chosen it was time to refine the detail of the palm tree style which meant sketching up some alternatives. With the aesthetic of the logo established and a further exploration into the tropical and minimal design goal the rest of the branding began to come to life by establishing font, colour and imagery style guidelines. These standards were then carried across all the new and existing branded material like e-books, social media templates and other marketing material. Overall this was one of those projects where we were given the freedom to express our creativity all while working towards a goal of giving Steph's branding more relevance and purpose in her business and the chance to utilise its true potential in helping get the message out there as authentically as possible.